One to One is an art installation which collaborates directly with women from Afghanistan who are attending literacy programs. The installation, when completed, will include a series of built structures. Fragile, delicate yet stable, these skeletal wood constructions refer to the framework for progress that women’s education can provide. The armatures will be embellished with a variety of materials including the artwork produced by my Afghan partners – a collection of 8’ x 10” drawstring bags with hand images embroidered, beaded or sewn on them. The individual hand images signify power, strength, blessing, protection, and justice. Shadow War encompasses the totality of my artistic practice, bridging the new materials and techniques of War/No War and the forms of previous installations and works on paper. Composed of roughly 400 unique pieces when complete, this project is another attempt to mark events through accumulation. In this instance, the number of images corresponds to the approximate number of American airstrikes in Afghanistan in 2012 and to a similar number that have occurred in Pakistan since the United States began its clandestine drone program there in 2004. 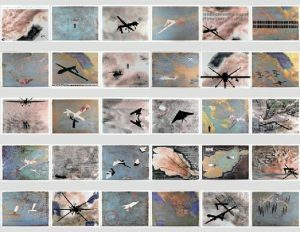 Each work is an original composition: the silhouettes of planes and drones appear in varying configurations, along with markings that evoke the guides and targets of a control screen. These painted, drawn and collaged forms are grounded on satellite images of locations in the Middle East and Asia. Mounted side-by-side in a large grid formation, the cumulative effect of these drawings is immersive and perhaps overwhelming. This installation differs from the more abstract quantifying of earlier projects. Unlike the personally significant fingerprint marks of a count or the clean graphic shapes of Inventory, each unit of this installation presents an image-based scene. Corroded by the transfer process, the aerial photographs take on an ethereal quality, appearing as though seen through a cloud of smoke from a distant explosion below. Disorientations occur: points of view become flipped from bird’s eye to ground-level, and figuration slips into abstraction. Taken both individually and as a whole, these representations remain shifting and unstable, a glimpse into a tacit war being waged unseen from above. For War/No War, I am using the pages of the New York Times as a source of raw material. The pages with articles relevant to the subject are being scanned, reconstructed, and then re-printed on transparent sheets of Mylar. The Mylar acts as a plate which can be run through a printing press or hand burnished to create a monoprint with the transfer of ink onto paper. This labor-intensive process is the beginning of a transformation which attempts to distill the essential truth behind journalistic descriptions of events and bring attention to this ongoing, more tacit warfare. Each monoprint is cut into the silhouette shape of a drone or fighter plane, and the Mylar plates are further altered by hand to resemble smoke-like abstractions. These elements maintain a ghostly impression of the original source but the abundance of information, once conveyed in articles and advertisements, is obscured. In the final installation I will collectively mount the individual elements in room size environments through which a viewer can move and experience a virtual theater of war.